All modern professionals need to be aware of the issues and risks relating to information security in today’s interconnected business environment. The impact of information security losses or breaches on the organisation, its clients and suppliers, can be monumental, whether they are caused by personnel error, system failures or malicious attack. The information security courses were written by a renowned information security expert with input from a group of leading international law firms, and were designed and developed by VinciWorks. "There was high quality content with useful information and reminders of basic precautions we can all forget." "Questions were engaging and thought provoking." "There were clear examples illustrating what the cyber security risks are in everyday life and how to manage them." Pricing starts at less than £5 per user. For a detailed quote, please fill in the form or call us at (+44) 020 8815 9308. All staff. Recommended as part of onboarding. 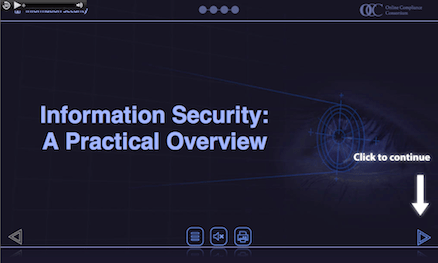 This short, iPad-friendly refresher course provides a framework for ongoing training in the important area of information security. Leading law firms are increasingly identifying information security as a key area of risk, and an important part of their ongoing compliance and risk management training programmes. The course also includes a customisable page allowing each firm to insert links to their own procedures and policies. All staff. Recommended for ongoing training. 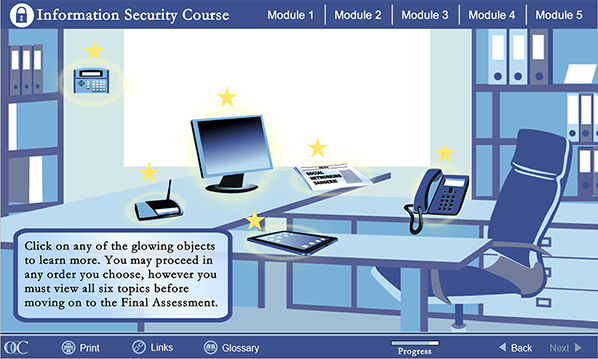 This course introduces the concept of “information security” to all staff. The content is based on ISO 27001 principles and includes scenarios, interactions, test sections and an option for customisation with firms’ key policy documents. Protecting client information, demonstrating compliance, implementing security arrangements and storing data properly will reduce interruptions to business continuity and help avoid financial, reputational or other loss. As such, learners in this course will be challenged to appreciate the risks they face and to implement best practice in the use of email, the internet, mobile devices, passwords and social networking.